Computers have been a part of our life since we can remember. In the 1980's we had a Commodore 64 computer system connected to a very small coloured tube TV. Remembering those cassette tapes and big floppy disks used to store data, mostly games or DOS files. Everything ran by code, it sounds quite complicated compared to today's technology. As a young adult my first computer was a custom built Pentium 2 replica with windows 98 and dial-up Internet access. It was slow but it worked! I seriously don't know how we all got through that era of technology, I remember suffering system crashes and blue screens too many times. Fast forward ten years and we have the sleekest piece of computer technology literally right at our finger tips in our home office: The HP Touch Smart 600 desktop PC. We love introducing new technology to our family. This new and innovative PC is created to be the hub of the home or office. Whatever you do in your day, HP has it covered with this one. The HP Touch Smart 600 is an all-in-one desktop PC with a slim, power-saving design based on a single foot base and comes with everything you could possible need built right in. The touch screen makes it easy to navigate around the computer with multi-touch gestures like pinch, rotate, arc, flick and press and drag. It includes tons of really awesome built-in touch-optimized apps that allow you to do everything from looking at recipes and pictures to playing games and using the touchable calendar to stay organized. Everything on the touch interface is customizable, just like your typical desktop! HP really did it this time, building on a heritage of industry firsts, HP brings today's best software and hardware together in this elegant third generation Touch Smart PC. Everything you've always dreamed of in a PC, right at your finger tips. NVIDIA GeForce GT230M graphics card and loaded with a blu-ray combo drive. Integrated bluetooth and premium wireless LAN. HP wireless keyboard with hide-away bay and numeric keypad. HP wireless Optical mouse. Touch enabled 23" diagonal full HD 1080p LCD display with Bright view technology and includes HP Ambient Light that lets you set the mood, or see your keyboard in the dark. When we first took it out of its crisp new box, the HP Touch Smart 600 already had us saying "Wow". It has a sleek and elegant body, nothing bulky and it takes up little room on our home office desk. Setting up was pretty simple, your basic plug and play type computer. We like that there is no big tower to set up, no pile of wires to have to fight through to get up and running. Just the PC, keyboard, mouse and remote! The first time we sat down in front of the HP Touch Smart 600 we were amazed by it's advanced technology. The touch display screen is really neat, allowing you more control over what your doing compared to a typical mouse pointer. It has POWER. We have run Windows 7 on other systems before and this just blows the competition out of the water. I have never seen Windows 7 run smoother than on this system. The sound is amazing with the Beats Audio console, taking control of music has never been easier. It was actually developed by HP in partnership with some of today's top music industry leaders including Dr Dre, Jimmy Iovine, CEO and founder of Interscope Records bringing us music the way it was meant to be heard. We tested it out on various genres of music and actually heard melodies, beats and background lyrics in songs that we hadn't heard before! Really incredible sound! The App Center is where you find all the cool built in apps. It features new Apps like Paint it! by Corel and Roxio Cinema Now, educational games for kids, useful utility apps and social networks like FaceBook and Twitter, all launched instantly from the HP Touch Smart home. Our daughter first tried out Paint it! She was amazed how she could create real looking paintings with the touch of her small fingers across the screen. Of course with a PC of this magnatude, she was monitored while using it. We still have so much to discover! I admit I've never been much of a chef and I hate browsing the web for recipes that I don't already have bookmarked but even then going through sites was a pain. Now, importing and managing recipes has never been easier, with a simple touch I now have access to my favourite recipes with the Touch Smart Recipe Box. Impress guests by entertaining them in style. You can watch, pause, rewind and record live TV with Touch Smart Live TV or Connect your gaming console like Xbox, Wii or PlayStation through the HDMI or composite inputs. We haven't tried these features yet but we do own an XBox console so it is definitely going to happen! There is honestly so much we still need to learn about this amazing piece of technology sitting in our home office. There is so much we can now do with this amazing piece of technology too! Definitely a recommended asset to your home office, provided your budget can handle it. The system does go for around $1500. The HP TouchSmart 600 really made a big first impression on this tech-savvy family. Visit the SmartTouch YouTube channel to check out some great videos showing exactly what we are talking about! 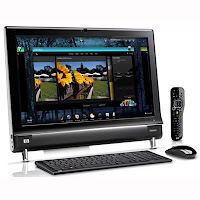 Stay tuned for future posts about things we have done with the HP TouchSmart 600 desktop PC!